2007. Designed with Paul Barnes for Laura Varacchi at Two Twelve Associates. Icons designed by Kevin Dresser at Dresser Johnson. Exclusive to the Empire State Building. Finished in 1931, the Empire State Building is, along with the Chrysler Building, the epitome of Art Deco style in New York City. In 2006, building changed ownership, and the new owners decided to undertake a major renovation, restoring the lobby to its original glory, upgrading the tenant floors, and eventually improving the Observatory experience. Beyer Blinder Belle Architects brought Two Twelve Associates into the project to rethink the overall wayfinding of the building and come up with an appropriate signage program. 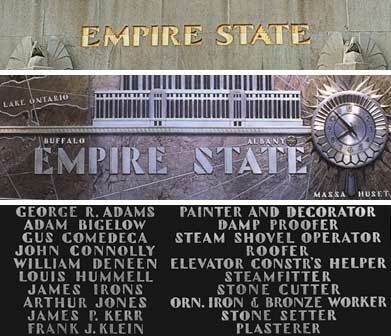 Faced with the prospect of continuing to use Broadway for all of the signage - a typeface more evocative of Miami Vice than the Empire State Building's iconic elegance - they contacted us about coming up with some more appropriate ideas. The original lettering carved into the stone of the exterior and applied to the mosaics in the lobby were the most obvious starting point, but they lacked a lowercase and were a bit 'too much' for general use in signage. However, several advertising types from the late 1920s and early 1930s surely influenced or were influenced by this popular style of lettering. Morris Fuller Benton's Louvaine and Dynamic, released by American Type Founders in Jersey City in 1928 and 1930, and Ultra Modern, released in 1928 by the Ludlow Foundry in New York, each provided convincing examples of what an appropriate lowercase might look like, and pointed to what a simpler companion style for more informational signage might look like. Our initial plan included a serif face for branding all of the retail spaces. Although this style turned out not to be necessary, it provided a starting point for the sans, which we condensed after seeing how long some of the lines of text had to be on mockups of the signs. The two related styles we created have been approved by the New York Landmarks Commission for use throughout the building, and have already started to appear on the construction scaffolding outside. Kevin Dresser's fantastic set of icons for things like no smoking and handicapped access completes the typographic palette.